I don't know about you all but I am ready for winter to be over! 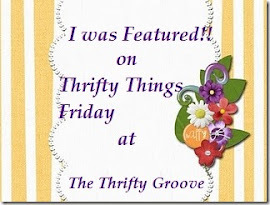 I'm tired of getting shocked when I touch anything. I'm tired of the cold. This past weekend it didn't get above 40 degrees. And I live in the south! I can't even imagine how my northern friends are feeling. Since the weather was a bit too cold for outdoor projects I decided to take care of some things on my to do list that didn't involve me being outside. 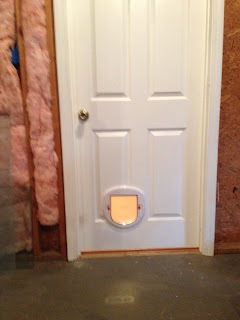 First on the list, install a pet door for the cats. 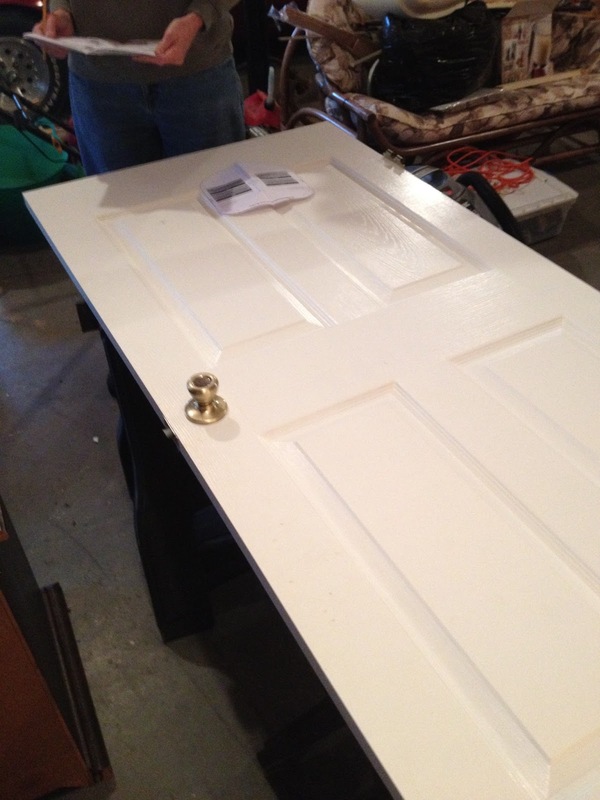 I decided to install a pet door on the door that leads from the finished side of my basement to the unfinished side of my basement. The cats love being on the unfinished side of the basement so I had been leaving the door propped open for them. Only problem is the finished side of the basement is heated and the unfinished side isn't. So as you can imagine I was losing lots of heat this way. First thing we did was mark the height where the cat door would be. The instructions tell you to stand your cat up against the door and make a mark at their shoulder height. The instruction writers have clearly never tried to hold a squirming cat while marking the correct height. It's definitely a two person job. Needless to say there are no pictures of this step. That would have made it a three person job. 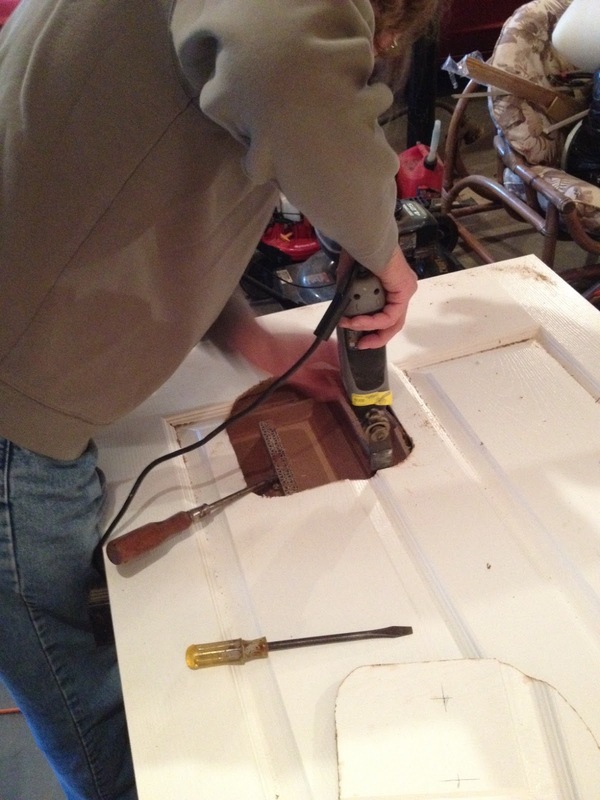 After you've got your door marked, take the door off the hinges and set it on a pair of sawhorses. The pet door came with a template. You take your template and place it in the middle of the mark on your door. 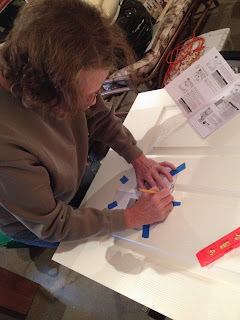 We then taped down the template and traced around the edges of the template with a pencil. Next is the fun part. Ladies you can do this yourself! We used a Dremel Multi Tool to cut out our template. It was a hollow core door so I'm not sure if the Dremel tool would be the tool you would want to use if you were cutting through a solid wood door. After you've cut around the edges of your template use a flat blade screwdriver to pop out the piece you've just cut. 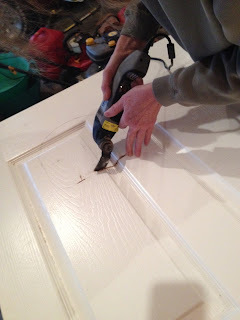 Then use the Dremel tool to clean up your edges. 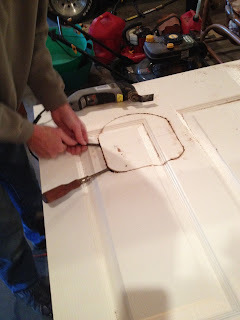 Once you have nice, clean edges flip the door over and cut out the other side.